Alex Paterson and co are used to huge venues and festivals, playing in front of thousands of people, but it is in the intimist settings of Arch 635 in Clapham, south London, that they chose to introduce their latest effort, Baghdad Batteries, to the world, in front of a crowd of just 250. The dress code du hour was uniformist to say the least: white overalls for all, with strict instruction that they should be worn during the band’s performance, making the place look like an over-busy crime scene of Silent Witness. Support was provided by Maliscious Damage’s Able & Cane and She Is Danger, the latter sounding something like Beth Gibbons submitted to electic shocks.While not really providing anything particularly new or fresh, the girls delivered a pretty sharp electro set. The Orb, in this particular instance Alex Paterson and Thomas Felhmann, were there with a mission: giving the first ever live performance of their recent album Baghdad Batteries, announced as the last in the Orbsessions triptych. While this was what the flyers promised, the actual set extended to a broader spectrum of tracks, primarily culled from the pair’s 2005 Okie Dokie album and early records, with Towers Of Dub and Little Fluffy Clouds here given, rather successfully, the resolutely Germanic free flowing minimal techno treatment that fuels the new record. The set was very much driven by Paterson and Felhmann’s recent direction and renewed energy, which first fully flared up on Okie Dokie and has developed into a slightly less-beat driven yet often as minimal form of dubbey techno on their latest. Styrofoam Meltdown or the splendid Suburban Smog especially worked rather well against the straight-up rhythmic drive of Ripples or Cool Harbour, while the ambient textures of Chocolate Fingers or Baghdad Batteries smoothened the transition between the various eras of the band revisited during the evening. There was often a sharp contrast between Paterson’s British exhuberance and Felhmann’s more reserved attitude (bring on the stereotypes if you will), but this is, after all, quite a prominent aspect of at least a fair slice of the Orb’s music, certainly when these two are concerned. The hour and a half set was rather sharp and lean, at times hard-hitting, at others smooth and fluid, peppered with moments of intense fun. The two were clearly having a good time, and even the dark mood that descended on Felhmann when a giant balloon, coming out of nowhere, landed on his drink, spilling it over his laptop, was soon lifted as Paterson joined in, sending more balls back to the crowd. The flyers promised a visual extravaganza, and the projections on the screen behind the pair certainly gave the music the extra dimension that it deserved. 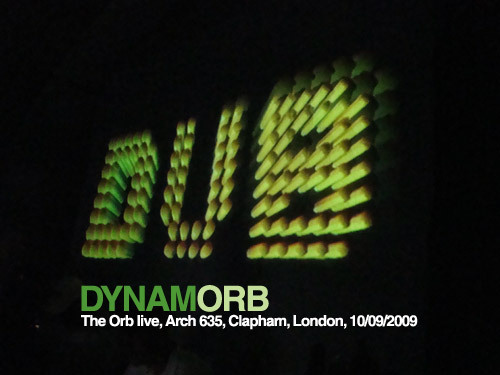 Alternating between computer generated patterns and logos, random graphics and treated pictures, the projections were overall pretty good and fitted The Orb’s varied selection very well, and never better than when the word DUB was floating over a black backdrop for a moment. It seemed at one point as if both Paterson and Felhmann were on for the long haul, but, while Alex Paterson was showing no sign of slowing down, Felhmann discreetly reminded him that they had to bring the show to an end at one point or another. The performance was brought to a close soon after, with the pair hugging and leaving the stage as Dean Martin’s That’s Amore was left spinning on the deck.